This meal is focused on tastes and textures. 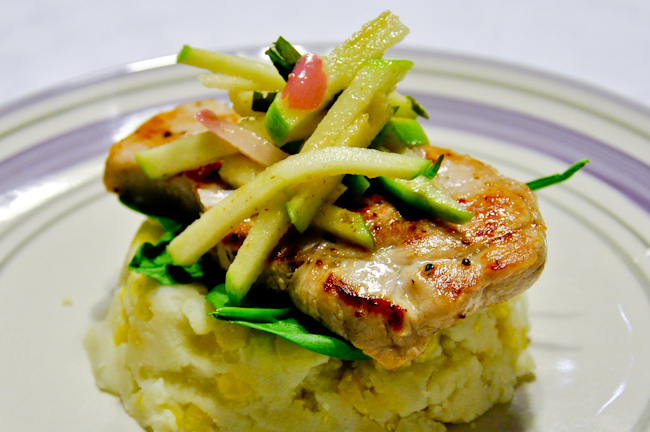 While the juicy pork tenderloin gives it a salty taste, the apple toppings balanced it with a sweet and sour taste. I even added the corn to the mashed potatoes to give it texture and that extra little surprise element when Glee takes a bite. I know Glee loves corn, so that also gives reassurance that it will be a successful meal for the family. When I serve the apple toppings on Glee’s plate, I took the time to pick out only apples for her. The tarragon and shallots might be too strong for her, so I just left it for the adults. She ended up eating the apples anyway.